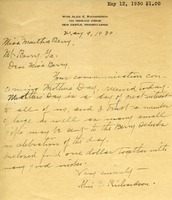 Miss Alice E. Richardson sends a $1.00 donation to the Berry Schools in celebration of mother's day. 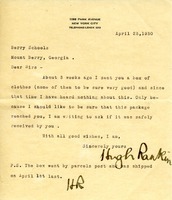 A letter written by Hugh Rankin of New York to the Berry Schools inquiring about a package of clothing he had sent previously by parcels post. 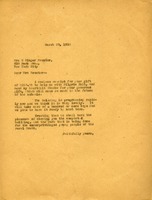 Mr. Rankin requests confirmation that the Berry School received the package. Miss Berry thanks Mr. Purves for his gift and invites him to visit the schools, explaining the goals of the schools. 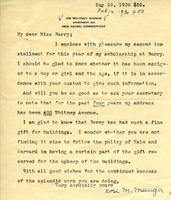 A letter from Martha Berry to Mrs. Proctor containing a receipt for $250.00 for the gift towards the building of Pilgrim Hall and the invitation to visit and see the building when it is completed. 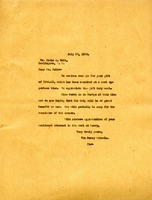 Ella writes to Martha to let he know she has not been forgotten, but it has not been convenient for Ella to send her usual donation lately. But as long as she has the means she will donation for the good work at the schools. 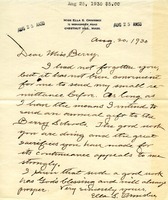 A letter from Martha Berry expressing thanks for a gift and inviting Mrs. Morris to visit the school. 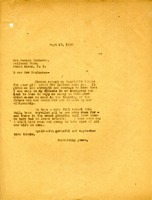 In this letter The Berry Schools thank Mrs. Morris for her donation of five hundred dollars on behalf of Martha Berry because she is away. Martha Berry thanks Isabella Hopkins for the gift she has sent to Berry, as the school is currently enduring some hard times. 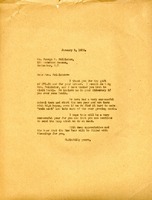 Martha writes to Mr. Hollister thanking him for his gift to the school and hopes that she will include the school in their itinerary if they ever come south. 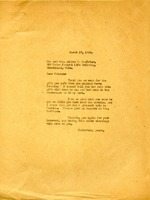 Martha Berry thanks Valentine for his gift which came at a time of great need. 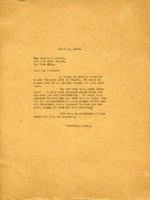 She praises him and his parents who were among the earliest friends of Berry. She explains that they are economizing all they can, but still she feels like a mother who cannot take care of the needs of her children. 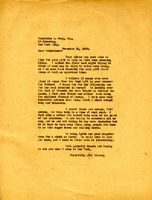 Miss Berry also invites Valentine to bring his wife, Lydia, and his daughter to visit Berry. 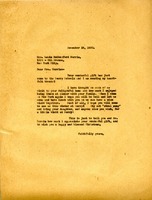 Letter to Bessie MacLuman from Martha Berry thanking her for the gift that she sent to the schools, via Mrs. Hammond. Miss Berry informs her that it is a great comfort to know that whenever the schools are in trouble that she can count on her friends. She also informs her about the status of the schools. She says that the school is filled to capacity and that they still have young people that want to come but that they don't have room for. She thanks Mrs. MacLuman again. 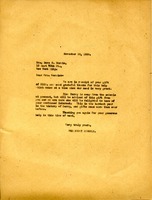 Martha Berry thanks Mr. and Mrs. MacBriar for the gift she left when she visited Berry.